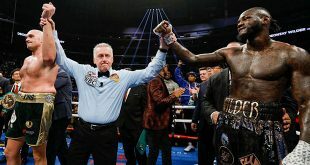 There were two 12 round WBO title fights last night at Coliseo Universidad Del Norte in Barranquilla, Colombia and when the smoke finally cleared, both reigning champions held onto their belts. Longtime WBO Minimumweight king Ivan "Iron Boy" Calderon, one of Puerto Rico's most decorated active professional fighters, was involved in an absolute smoker against hometown hero Ronald Barrera. For twelve intense rounds Calderon, 28-0 (6), and Colombian Super Fly titlist Barrera, 20-3-1 (12), battled back and forth with the tide turning in each man's favor more than a few times but it was Barrera who seemed to have more in the tank by the end of bout. The judges found favor with Calderon's higher quality early work and declared the visiting titlist the winner by split decision 115-113 (twice) and 113-115. "Iron Boy" has now defended his belt 12 times since winning the title four years ago. The 32 year old Calderon will step up to light flyweight to challenge the WBO Champion at that weight, Hugo Fidel Cazares, in the more familiar locale of Bayamon, Puerto Rico in August. 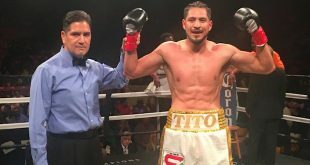 In the other WBO title scrap, light welter supremeo Ricardo Torres, 31-1 (27), dominated Mexico's Arturo Morua, 24-9-1 (13), over all twelve rounds of the bout to win a wide points decision. 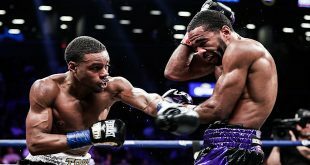 The tremendous punching power of Torres kept Morua from getting ambitious and the visitor has now lost a WBC title challenge to Junior Witter and an IBF title eliminator over the course of the last year and a half. Torres must next face mandatory challenger Kendall Holt in what should stack up as a classic puncher vs. boxer matchup. Andy Ruiz vs. Adam Kownacki: Who wins?